A Liberal's Libretto: Mercury and Caballé - "Friends until the end ... Viva - Barcelona!" Mercury and Caballé - "Friends until the end ... Viva - Barcelona!" Tonight, the Summer Olympics open in London. I'm sure the Opening Ceremony will be a grand spectacle as always ... Remember the Summer Olympics in Barcelona 20 years ago? If you had asked me in the late '80s who Freddie Mercury was, much less Queen, I couldn't have been able to tell you to save my life. That all changed in the very early '90s. I'd like to say it was because my liberal heart and mind were tuned to the AIDS crisis, of which Mercury became a victim. But, actually - it was because of Barcelona. Freddie Mercury was a true musician - and above that, a lover of all types of music. Believe it or not, you can be a musician and be particularly close-minded when it comes to other types and genres of music. That love for all genres became evident when he developed a deep friendship with Spanish soprano Montserrat Caballé. He was truly in love with her voice and what she could do with it. It all began when he attended a performance of Verdi's Un Ballo in Maschera at London's Royal Opera House - Covent Garden in 1983. He was hooked. In fact, the love of her voice became so strong that Mercury flew to Barcelona in 1987 to personally give Caballé a cassette tape (remember those?) with a few songs that he hoped she would like and would ultimately agree to perform with him. The collaboration began when the rocker sat down at a piano and played various melodies for the operatic legend - asking which one she preferred. By April of that year, Caballé was committed to the project and Mercury began work. The difference between Freddie and almost all the other rock stars was that he was selling the voice. His technique was astonishing. No problem of tempo, he sung with an incisive sense of rhythm, his vocal placement was very good and he was able to glide effortlessly from a register to another. He also had a great musicality. His phrasing was subtle, delicate and sweet or energetic and slamming. He was able to find the right colouring or expressive nuance for each word. At the end of May the island of Ibiza staged a huge festival at which Mercury agreed to be a guest of honour - on one condition. 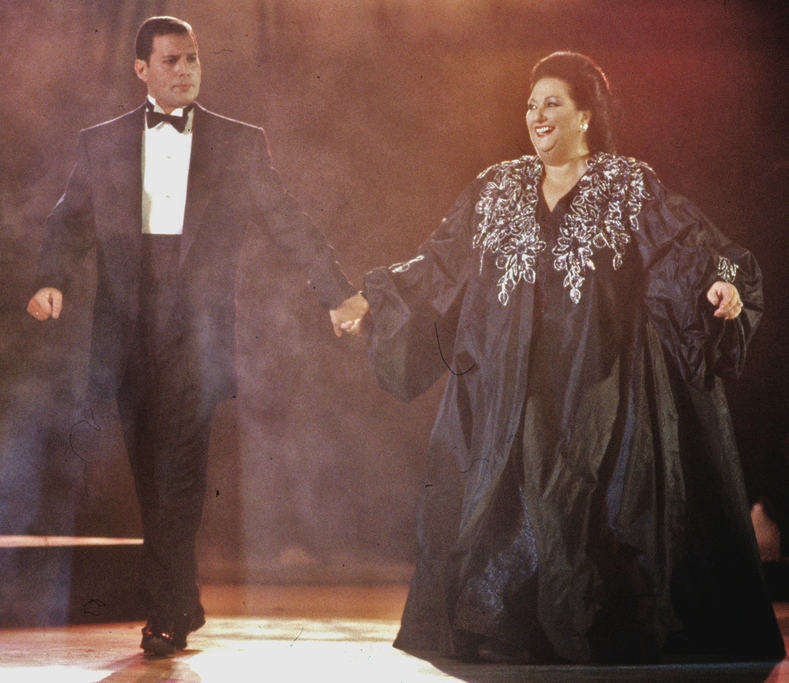 He requested to close the event with Montserrat Caballé singing the song he had written for her and her home city, Barcelona. A little over a year later, on October 8th, 1988 Mercury and Caballé performed Barcelona to celebrate Caballé's home city being chosen as the site for the Summer Olympics of 1992. It was quite the spectacle. I have always held Barcelona near and dear to my heart... not because I have any ties to the 1992 Olympics or Barcelona - but, because it was the first time I had heard an operatic superstar doing something that was mainstream... this was before the Three Tenors became a phenomenon. And, I'll be honest - after hearing Barcelona, I fell in love with Caballé and her voice. That last frame of the two holding hands is particularly touching. As I said, the duo had a very deep friendship. So deep, in fact, that Mercury confided in Caballé that he had AIDS long before the public knew. Caballé discusses it in this brief interview. Freddie Mercury died of bronchopneumonia brought on by AIDS on 24 November 1991, only one day after publicly acknowledging he had the disease. His 1988 performance with Caballé in Barcelona was the last time he performed on stage. At the Opening Ceremonies of the 1992 Summer Olympic Games, just months after Mercury's death, Montserrat Caballé sang the Barcelona duet with Freddie Mercury's likeness projected onto a screen. It was an extremely moving moment. The beauty of this performance is founded in the unconscious awareness of the true nature of both themselves. Monserrat has the perfect tecnique of a soprano, Freddie the bariton’s one, while she is in here heart a mezzo-soprano and he in his one a true tenor. What a match! Montse was definitely NOT a mezzo-Soprano. Ever - certainly not in her heart either.